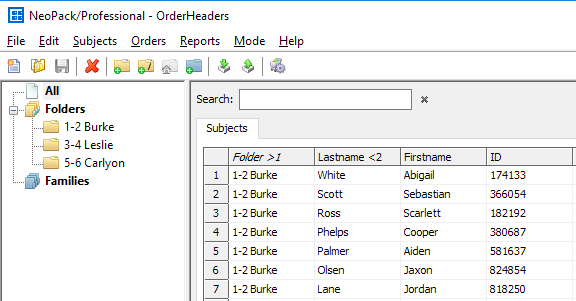 The ability to sort data by simply clicking a column (field) header has been a long standing feature in Details Mode. A limitation however has been that only a single level of sort was available - it was not possible to sort by more than one field simultaneously such as sorting, say, by the folder field then the subject lastname. Sorted columns are displayed with a number indicating the sort order. The number 1 represents the primary sort filed, 2 the secondary and so on. A greater than symbol (>) indicates ascending order whereas a less than symbol (<) indicates descending order. The specified sort is a function of the current application at the current workstation. It is not saved with the job.